The nearly supernatural nature of this groundbreaking work can be glimpsed in the book’s title. 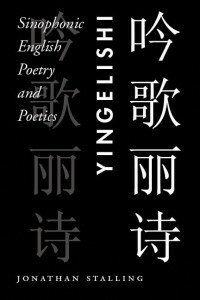 When read aloud, Yíngelìshi (pronounced yeen guh lee shr) sounds like an accented pronunciation of the word “English,” while the Chinese reader sees the Chinese characters for “chanted songs, beautiful poetry.” Stalling coined this term (and “Sinophonic English”) to give a positive name to an increasingly widespread variation of English created by combining the two dominant languages of globalization (Mandarin Chinese and English). With over 350 million English speakers in China (more than there are Americans alive) many of whom speak English by recombining existing Chinese sounds into English words and sentences, this new hybrid language is already overwhelmingly present, yet its aesthetic potential has not yet been explored. Stalling’s book complicates any easy dismissal of so-called Chinglish by creating a poetry written entirely in Sinophonic English. Stalling rewrites a common English phrasebook into hauntingly beautiful Chinese poetry (which is all translated into English) that when sung, becomes an uncannily accented libretto, a story of a Chinese tourist’s one-way journey into this interstitial language and its sonorous, if disastrous, consequences. The above video is a recording, with instrumentation, of the opera. For more about the opera version of Yingelishi click here. A TEDx talk by Jonathan Stalling, featuring Yingelishi. Jonathan Stalling is an Assistant Professor of English Literature at the University of Oklahoma. He is the author of Poetics of Emptiness: Transformations of Asian Thought in American Poetry (Fordham University Press, 2010), and a co-editor of The Chinese Written Character as a Medium for Poetry, A Critical Edition (Fordham, 2008). He is also the author of a book of poems, Grotto Heaven: A Revised Grammar Book (Chax Press). from Marjorie Perloff: Two seemingly alien languages interact, collide, call each other into question and create a soundscape unique among contemporary poems. 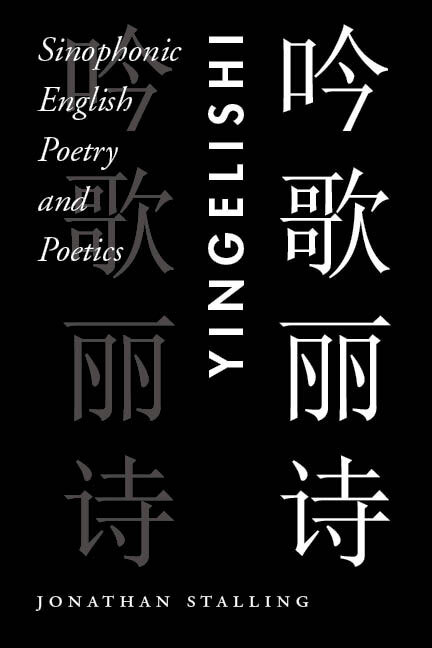 Its “Yingeleshi” texture (fusing English words, Chinese calligraphy, and instrumental accompaniment) produces an entirely new experience for the reader, pointing the way to what a truly global poetry might look like. from Jerome Rothenberg: a ravishingly beautiful series of poems both spoken & sung. I have now been going through these from a number of different directions, reading & listening, finding satisfactions, like those of all real poetry, that grow deeper & richer from one immersion to the next. Yíng?lìshi, once entered, has enough pleasures to last a reader’s lifetime. from Michelle Yeh: Whereas the visuality of Chinese characters inspired Pound to renew American poetry, Jonathan Stalling finds an abundant creative resource in the sound of Chinese. The process of transforming Chinese pronunciations of elementary textbook English into evocative, beautiful poetry is nothing short of magic.